The solution from Germany: Arena footing system with integrated irrigation and drainage. This German engineered invention is the premier all-weather riding arena. While nature delivers high and low tide to the beach, you can regulate the ebb and flow of water to your arena, creating continuous perfect moisture at every inch. The subterranean irrigation system has a high drainage capability – during rainfall the excess rain water is simply removed thru the sub-system! We offer professional consultation, planning and complete construction of Ebb and Flow arenas throughout the United States. This arena system can be built on any impermeable soil or other difficult terrain, e.g. close to hill sides. The Ebb and Flow system combines the ‘base and footing’ in one and ensures optimum and even moisture condition from below. Unreliable overhead sprinklers and overwatering with water trucks are the past. Large amount of water during heavy rainfalls is easily pumped off thru the system. A specially welded liner establishes a watertight basin on which the moisture exchange system is installed. Special drainage pipes are laid out and then connected to sensors and a pump which regulates the optimum water level underneath the riding surface automatically. 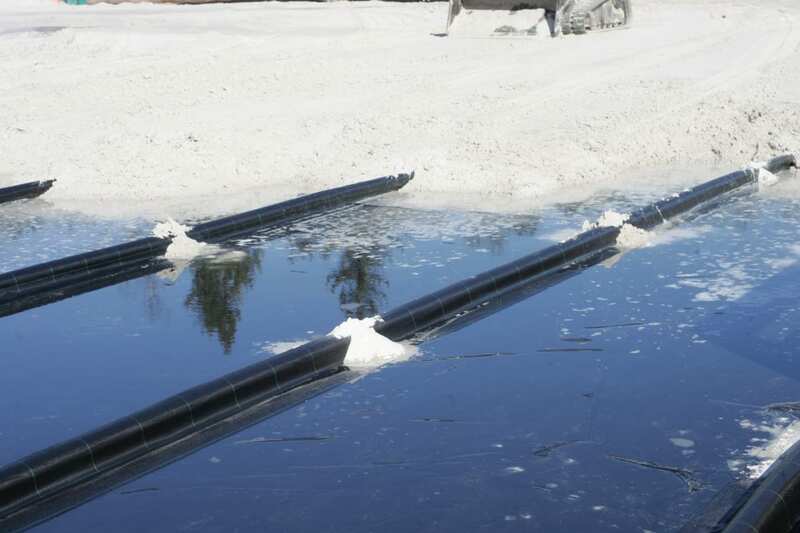 Then the system is covered with 13 inches of capillary silica sand and FSGeoTEX geo-textiles. The footing is given its constant basic moisture and elasticity by the capillary effect of the sand. German Olympic Riders train on their Ebb and Flow System at home: Ludger Beerbaum, Otto Becker, Christian Ahlmann, Katharina Offel, Isabel Werth, Ellen Schulten-Baumer and many more. Germany’s Show places like ‘Horses and Dreams/ PSI auction’ and Bundeschampionat Warendorf have installed the system over the past few years.